On Wednesday night’s The Rachel Maddow Show, host Rachel Maddow rightly questioned why the media has, so far, given Republican presidential nominee Mitt Romney a pass on his avoidance of service in Vietnam, and his subsequent contradictory and misleading (to put it kindly) statements about it. 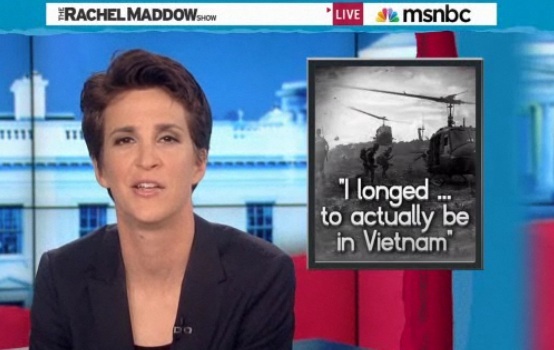 However, Maddow’s segment, and the Associated Press report it was pegged to, fail to acknowledge that Romney faced his own “tough” times during Vietnam. One of the things that sets Rachel Maddow apart from other cable news commentators is her non-linear rhetorical style. Rather than a typical beginning-middle-end structure, Rachel Maddow’s video essays employ a technique involving repetition. It’s a technique involving repetition of what she has said so far, but adding something new with each repetition. The repetition of what she has said so far reinforces each of those points, plus the new points she adds with each repetition. It’s an effective technique that accomplishes two things: driving home the premise of the segment in a powerful way, and building anticipation for the main point of the segment. Rather than setting up a series of dominoes, she’s setting up stacks of them, so when they fall, the impact is greater. With that professionally-done build-up in place, there’s one Romney quote that serves as the perfect punchline to this whole story. Not a “ha ha” funny punchline, but one that sums up the sense of entitlement that allows Mitt Romney to take to the streets in favor of the draft, yet avoid serving himself. Many French people at the time were “not happy to see Americans, because we were in Vietnam at the time. That was tough,” (Romney) added. There’s another bit of context missing from that AP report, as well. After Romney said he “longed in many respects to actually be in Vietnam,” he explained to that same Boston Globe reporter that it was his father’s fault he didn’t go. “When my dad said that he had been wrong about Vietnam and that it was a mistake and they had been brainwashed and so forth, I certainly trusted him and believed him,” Romney said.